We, at Aarsun Woods, have 30+ Years of Experience in promoting Wood Handicrafts and Hand-carved Furniture holding global clients with roots in Saharanpur - a world famous city for its handicrafts. Though the name Aarsun (TM) is registered adapting to the dynamic Global market however our parent firm still exists catering our old clients with the same zeal. People across globe love Saharanpur wood Handicrafts and Saharanpur Wood Furniture and Aarsun loves when people call to check “Are you from Saharanpur”. Aarsun Woods, an ISO 9001:2015 Certified Company, has been awarded Global Excellence Award 2018 being the best handicrafts and furniture manufacturer in state of UP. We have delivered our hand-carved products in all corners of India and to many countries globally. Wood Carving is a fine art that is developed with years of experience and knowledge about the quality of wood. 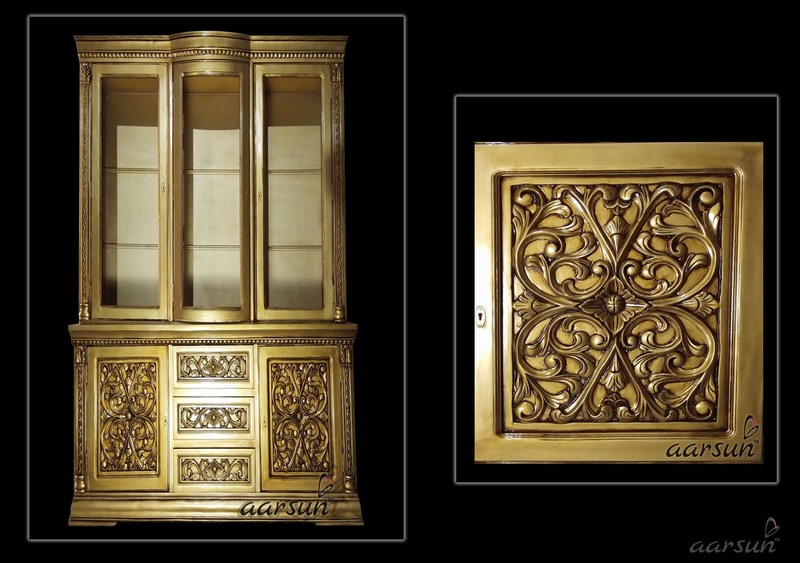 From small jewellery boxes, kitchen spatulas to home temples, partition screens, handcrafted home furniture viz bedroom sets, sofa sets, dining sets, wardrobe, settees, bar cabinets and chairs, wall decor items to a range of export items, Aarsun has supplied our artisitc products globally. Selection of right type of wood and use of seasoned woods improves the life of the product and the right polishing gives the enriched look to the product as required by the client. Our artisans have created masterpieces time and again for made to order products as required by our customers, be it the corporate gifts with carved Names or the grand looking furniture sets used by the royal families. Each unit is hand-made and thoroughly inspected before it is sent to the customer to bring the satisfaction of our customers. Being our family business and three generations of expertise we have always taken pride in delivering what is required by our clients. Our business solely depends on the quality of our products as most of our clients have been associated with us for more than a decade. Our business theme always suggest the satisfaction of our clients for the money they have paid. Aarsun Woods is now doing business with all major e-retailers and providing high quality wooden products under the brand name of Aarsun. With thousands of happy customers from our online stores in last few years our customers have appreciated our art and quality time and again. With an aim to make “Aarsun”, the brand and Saharanpur as synonyms, we have taken our best foot forward and wishes to engage with people world-over to showcase the talent of the cottage Industry of Saharanpur for Wood Handicrafts and Wood Furniture. Some of our work is displayed on the website and we would constantly update our work to keep the art alive and not to be taken over by automation through robotics & CNC machines.